JANUARY 10, 2012—I was honored to interview Gary Renard, best-selling author of The Disappearance of the Universe and Your Immortal Reality. Gary has had an amazing spiritual journey. Beginning in the early 90s, two enlightened teachers, Arten and Pursah, suddenly appeared in his living room and began revealing the secrets of our existence and the power of forgiveness, as well as providing valuable insights into the teachings of A Course in Miracles (ACIM). Gary has since traveled the world as a spiritual speaker. Not bad for a shy guitar player. I started the interview by letting Gary know that I had read his books numerous times and found them fascinating. 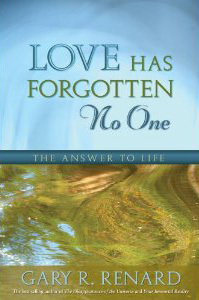 I was curious about he upcoming book, Love Has Forgotten No One. I asked him to tell me more about it and wondered if the infamous enlightened teachers, Arten and Pursah, were going to appear in the third book, as they had in the previous books. Many ACIM students have been waiting anxiously for the release of his new book, and he explains why it is taking so long for it to be published. “A lot of things have happened in the last couple of years. When the book starts, I am living in Maine with Karen [his former wife] and by the time the book ends I am living in California with Cindy [his current wife]. Part of the book is about is the breakup of my marriage, personal relationships and everything that happens along the way, but these events also caused part of the delays. Going through a divorce and moving was very difficult. On top of that, for the last two years, I have been going through an audit by the IRS, which has consumed a great deal of time and been very distracting. There has also been all this traveling that I have been doing all over the world, especially for the last few years. I have been to 42 states and 23 countries, many of them multiple times, and I find it very difficult to write on the road. People don’t know all the things that you go through on the road and what it takes to appear in these different venues. There are so many distractions. But, what I’ve started to do is take time off of traveling. For the next four months, I am not going anywhere, unless I want to, and this will give me time to catch up on my writing. Gary then begins to explain what the new book is about. Gary and I laugh at this simple explanation. He responds, “Absolutely! In fact, the issues that they have are already there before they ever appear here. If you want to go back to the beginning of time, the Big Bang, everything that is going to happen throughout the history of the universe was determined at that moment. Now, people want to believe that they are making this up as they go along, but the truth is it’s already happened. It’s like watching a movie. I ask Gary if we can alter our destiny. He says, “I think my teachers, my books, and A Course in Miracles are very clear as to how we alter that. It’s really by looking at it differently. It’s about taking on a different interpretation of it. The world is not being done to you. It’s actually done by you. It’s not coming at you, it’s actually from you. And that reverses the whole thing. If the world is being done to you, you’re a victim. If it’s being done by you, then you are not a victim. What that does is start to put you as the cause, instead of being an effect. It’s kind of like being in a movie theatre. You’re looking at the screen and kind of get sucked into the story. You might even get emotional and talk to the screen. But, let’s say you want to change what’s on the screen. In a movie theatre, it’s not going to do much good to fool around with the screen. There is not really anything happening there, it’s a trick. It’s an illusion, just like this world. If you really want to have a permanent impact on what is on that screen, then you would have to remember that there is a projector hidden at the back of the theatre. You would have to find that projector, change what’s in the projector, then the screen will take care of itself. Now, you’re concentrating on the cause instead of the effect. It’s also says, ‘Seek not to change the world, but choose to change your mind about the world.’ When you do that you are dealing with the cause instead of the effect. Which is also why the Course says, ‘I am never upset for the reason I think.’ I am upset because of what I think I am seeing on that movie screen. Once you really understand that you are the cause of the whole thing, you can stop judging people, you can stop making them wrong. You can look past the illusion. Then, Gary goes on to explain the third step which is to look past the illusion and see perfect Oneness. It’s like you are looking past the body, past the illusion, and seeing perfect Oneness. This is very important, because when most people think of the spirit, it’s still the separation idea. They think they have a soul and when they die there is this thing that goes on after them that still looks like their body, which stays with the concept of individuality. What the Course is teaching is that real Spirit is one. It’s no different than heaven. It’s the awareness of perfect Oneness. The knowledge there is nothing else and everything else is an illusion. We look out there and see 7 billion people, when the truth is that there is really just one of us. There is really just one ego that thinks that it’s here and has separated itself from its Source. And that one ego is you…there is nobody else. Gary explains that our unconscious mind knows there is just one of us. Gary says, “Your unconscious mind knows that there is just one ego appearing as many. The ego that is hidden in your unconscious mind acts as the projector that is projecting the image of this universe, time and space. If your unconscious Mind knows everything, you have to ask yourself, ‘What am I doing if I go through life judging, condemning and reacting to other people? All that I am really doing is judging and condemning myself.’ Because there really isn’t anyone out there for my judgment to go to. My unconscious mind will interpret anything that I think about another person to be a message from me…to me…about me. The only way that it can interpret what you are thinking is that it is about you, because it knows everything and one of the things it knows is that there really isn’t anyone out there. There is just one of us. When you start to grasp it, I think you would want to be very careful how you think of other people. All your thoughts are doing is setting up how you feel about yourself. It ultimately is determining your own identity. The way the mind works is…if you are thinking others are perfect spirits that are completely innocent and in heaven with God, then, your unconscious Mind will interpret that to mean that you are a perfect spirit in heaven with God. You are completely innocent. You are a perfect spirit. If you go through life as most people do, you will think bad things about other people, such as that guy’s a jerk, or that person isn’t smart, or curse a person who cuts you off in traffic. What most people will never realize in their lives is that every one of those thoughts and every one of those statements is really going to them. People wonder why they are depressed. Just think of the thoughts they have been having. Gary says, “That’s actually the first step. Stop thinking with the ego. You stop thinking these negative thoughts. Unfortunately, that takes discipline, because usually when you get out there in the street and stuff starts going down the tubes, it’s easy to slip back into your old mode of thinking. I think what made the great masters, such as Jesus and Buddha, who they were was that they realized that the world was not being done to them…that it was being done by them. There is power in that idea. There is no power in being the victim, but there is plenty of power in being a cause instead of an effect. You can start thinking clearly. You can switch to the Holy Spirit instead of the ego. If you want to return to what you really are…and granted not everyone is ready to do that…but, if you choose to do that, then you want to think like the Holy Spirit. Gary answers, “That’s true. At one point, the Course says in Lesson 68 that no one can imagine a Creator who is not like them. Jesus however was different. Instead of dragging God down to his level, he realized that if he wanted to go home to God, what he had to do was go up to God’s level. That means thinking with the Holy Spirit. God does not interact with the world. He does not acknowledge it. If He did, He would be just as crazy as we are. The Holy Spirit, which is the memory of God that we have in our Mind, reminds us of whom we really are, and how we can re-experience that and go home to that. What Jesus did was go up to God’s level by thinking with the Holy Spirit. In the Course, he says at one point that he only listened to one voice. What he means is that he just listened to the Voice of the Holy Spirit. “All he was doing 2,000 years ago, and you see this in the gospel of Thomas in the Bible, was simply pointing people in the right direction. He was saying this worked for me, maybe you should check it out. Maybe it will work for you. He wasn’t trying to start a religion. That is why the Course is not a religion. It’s not something you have to believe in. It’s not something you have to tell anybody about. It is really a self-study course, something that is done between you and the Holy Spirit or Jesus or whoever you look up to, and it doesn’t claim to be the only way. The Course does claim to be a faster way to go home. At the end of the day, spirituality is a personal thing done between you and God, or you and the Holy Spirit. There is a recent poll that states that 85% of people describe themselves as spiritual but not as religious, and there was a corollary opinion poll where 85% of people who go to church say that they don’t believe that the church accurately preaches the teachings of Jesus. Yet, churches are important in the sense that they are social institutions. People have to have a place to bring their kids and get them baptized, have weddings and funerals and those kinds of things. At the same time, even when you go to church, the spiritual part of it is personal…it’s something between you and God. I really see apple and oranges going on there. You have the religious institution, which is embodied by the apoplectic religious figure of Jesus, which isn’t what he was really like, and then you have this personal thing going on between you and the Holy Spirit…and that is what Jesus was really like. The approach of the Course and certain aspects of Buddhism is that you don’t have to do anything about the real you. The real you is a perfect spirit. And, because it’s already perfect, you don’t have to do anything about that. That’s what you are. All you have to do is undo the false you, which is the ego. He answers, “At one point, the Course says forgiveness does nothing. But, it does say the Divine does. Salvation is undoing. The way that you do that is by doing nothing. It means that you are not reacting. You don’t have to respond to the ego. You don’t have to respond to the world. You do have to change your mind. You do have to make a choice. This kind of forgiveness is done such a way where you are not making the illusion real. Judgment is making it real. If you are doing that then the Course says you have made it real and so you cannot forgive. When the Course says do nothing, you don’t have to do anything about the situation except let it go and overlook it. So now, you are not forgiving people because they have done something, you’re forgiving them because they haven’t really done anything. You don’t have to do anything either, except overlook it with the Spirit. Atonement is the principle of undoing the idea of separation. You can also think of it as the end game. So that is your one responsibility…that you have to practice forgiveness. You don’t have to worry about anything else. This kind of forgiveness looks past the world, instead of judging it, and thinking in terms of reality, which is Spirit. And that’s really a conscious decision that you do have to make. It doesn’t mean that you won’t do things in the world, it just means that you look at it differently. You can decide to see it right. You can decide to see with the Holy Spirit. That’s a decision and it’s a decision that only you can make. That is the basis of the Course. It’s not about changing the world, it’s about changing your perception to that of the Holy Spirit. All the rest is just what you do in the world, which is really the ego’s script. Gary goes on to explain that the value of past lives is knowing that we have dealt with the same challenges lifetime after lifetime. He explains, “At the same time, this is where we have to deal with it. In my second book, my teachers had me name one of the chapters, It’s This Lifetime Stupid, because we have to deal with what’s in front of our face to be able to forgive it. I don’t want people to think that it is all work, because it can be fun as well. This is a happy form of spirituality. One of the 10 characteristics of the teacher of God in the Course is joy. It talks about a happy dream. It talks about being a happy learner. There’s a lot of permission to have fun. In fact, at one point, the Course in Miracles says when there is nothing left to forgive, you should celebrate. The only time you have to forgive is when you start to feel uncomfortable, annoyed, or a lit bit angry. These are red flags that tell you that there is something to forgive. Gary responds, “Yeah. It’s beyond comprehension. That first seeming separation from God…and I say seeming, because the Course would say that it really never happened because it’s just a dream. Now, events in a dream do appear to be real, I am not denying that. I had a dream in bed last night that seemed completely real to me. It was as real as being awake during the day, and when I woke up I was actually surprised that it wasn’t true. The time will come when we wake up from this dream, which is simply appearing on a bigger level. You dream you’re born, you dream of this lifetime, you dream that you die, and then you dream that you have this in-between time, and then you dream you are born again. It’s a series of dreams until you wake up. You are actually awakening from the universe of time and space to a higher life form, which is spirit. I pause to reflect and then say, “I guess maybe it is getting better, a little every day and I don’t realize it. If I were to go back to a time when I first started applying this principle, I would realize how much progress I have actually made. But I am tired of being angry and irritated…even though I keep releasing it to the Spirit every day. He continues, “There are a lot angry people out there. That’s when you should think of Bob Newhart [referencing the video mentioned earlier in this article]. Just stop it! Just stop thinking that way. The anger is definitely the ego. Start thinking with the Holy Spirit. I am not saying that forgiveness is easy. But, remember that you are getting the benefits on some level, because every single time you practice forgiveness, there is some kind of a healing going on. Don’t forget that the Course says that a miracle, which is forgiveness, is never lost and can have undreamed of effects of which you are not aware. So, when you are practicing forgiveness, you are taking on your sole responsibility in this lifetime. The Holy Spirit is taking that forgiveness and using it to heal not just you, but also the universe. The Holy Spirit is shining that forgiveness throughout the whole universe of time and space, and even parallel universes that may exists, including all of your past and future lives. Every single time you practice forgiveness, it is never lost and there is a healing going on at the sub-atomic level. In fact, you or the other person may be healed of a disease you didn’t even know you had. At some point, you have to have faith in the Spirit, but I think that trust is earned. As you go along this path, you’ll start to realize that it is working. If it’s your hologram, the truth is there is nobody in the world that can upset you, unless you let them, because they aren’t even there. It goes back to the big teaching of the Course where it says, ‘Nothing real can be threatened…’ We are really spirit, which is immortal…it’s invulnerable. It’s something that can’t be touched by anything in this world. And when the Course says, ‘Nothing unreal exists…’ it means that anything that isn’t perfect spirit can’t affect us and we are starting to identify with our reality. Once you really start to get the hang of that more and more, then the world affects you less and less. There is an irony here. You would think that you would enjoy life less and less as this world becomes less real. But, just the opposite happens. As you have this unconscious guilt removed from your mind by the Holy Spirit as you practice forgiveness, eventually, you begin to enjoy your life more, because you don’t have this guilt in your mind. And, yes, you know it’s not real. However, when I go to the movies, I know it’s not real, but that doesn’t stop me from enjoying it. I mention that I was watching the TV show, American Choppers, where they build custom motorcycles. The stars, Senior and Paulie, who are father and son, were having a build-off contest and the bikes would be judged at the end of the show. The third contestant was Sandra Bullock’s ex-husband, Jesse James, who kept saying disparaging remarks about the other two. As I watched, it became very apparent that everything Jesse James said about the other two men was how he felt about himself. I interject that if people understood this, they would be embarrassed that they are advertising their own perceived faults. Gary says, “That’s right. The majority of people in groups or on the Internet who are angry don’t know that they are projecting. I would say to them that they would be a lot happier, and make advances light years above what they are doing, if they would just calm down and try to think with the Spirit. Stop judging and reacting, and start realizing that this is their projection and their hologram. They put it there. It doesn’t have to affect them. At one point, the Course says, ‘Every response to the ego is a call to war…’ and war does deprive you of peace. But in this war, there is no opponent. It’s as if you are playing a video game, except you are the only one in the room. There’s nobody else. It’s just you and the video game. This video game is pretending to hurt you…pretending to shoot at you. But, you know it’s just a game and that it’s not true. So you are not going to react to it. That is eventually how the world can be, but it gets easier to do that as you practice forgiveness. You have to stop judging with the ego, stop reacting, and stop making others wrong. Then, you can start thinking with the Holy Spirit. This is your video game; your hologram and nothing can affect you unless you say that it can. You can stop being an effect and start being the cause. And start thinking with the Holy Spirit to forgive the whole thing…not because it’s real, but because it isn’t real. Then you can take a big step, which is to look beyond the whole thing. Remember that everywhere the Holy Spirit looks, He sees Himself, which is this perfect Oneness. A big mistake when people forgive is that they believe, ‘I am forgiving this person over here or over there.’ No. You are forgiving everyone and everything all at once; every single time you forgive somebody. You are overlooking the illusion and seeing every one exactly the same as God. Nothing less than God. That is how Jesus got in touch with his own divinity…by seeing it in everybody else to this reality that is actually the same as God…which is bigger than the universe of time and space. Gary replies, “The truth is he did have some forgiveness lessons to go through, but not a lot. Usually, if someone comes back for their final lifetime, they don’t have a lot to learn. Jesus was in that position, he didn’t have a big learning curve to go through. Usually, a master in their final lifetime will have one big lesson that he wants to both teach and learn. In the case of Jesus, he wanted to overcome death. The real message of the crucifixion was that he could not be hurt and not be killed. It was a pretty big lesson. He didn’t have much to learn, which is why he was such a great teacher. He didn’t have any stake in what people thought about him or what they would say about him, because he did not identify with the body. “That will be great! Because that’s closer to where the rest of us are. Gary answers, “I just knew. The first time I saw her was at a distance, but I didn’t talk to her. Then, two years later, she came up to me at a book signing. I just knew. I have a lot of visions, memories, intuitions and feelings that come to me. And sometimes, when I am sleeping or dozing off at night, I have these visions that are almost like watching a movie. Once in while, when someone who was really important to me in a past lifetime comes into my space, it becomes conscious. It’s such a strong feeling that there is no doubt about it. And there will be visions later to confirm it. I tell Gary that the reason I had asked him to do this interview was because the thought had come to me during a meditation and I felt it was inspired by the Holy Spirit. I am glad the Holy Spirit was speaking to the both of us. For more information on Gary Renard, visit his website at GaryRenard.com. Thank you so much for doing this interview! I read it on Easter Sunday and I cannot think of a better sermon. Thanks for reading the article. It’s a wonderful overview of why we’re here and how to get back home.